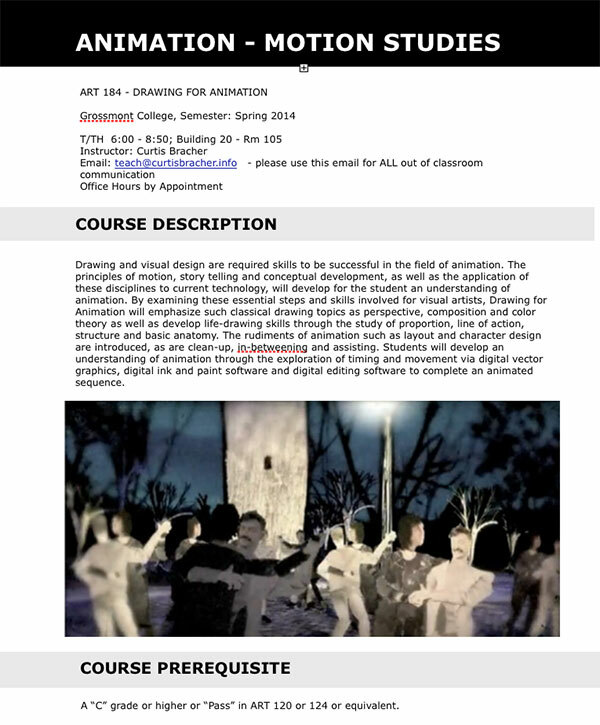 The principles of motion, story telling and conceptual development, as well as the application of these disciplines to current technology, will develop for the student an understanding of animation. By examining these essential steps and skills involved for visual artists, Drawing for Animation will emphasize such classical drawing topics as perspective, composition and color theory as well as develop life-drawing skills through the study of proportion, line of action, structure and basic anatomy. The rudiments of animation such as layout and character design are introduced, as are clean-up, in-betweening and assisting. Students will develop an understanding of animation through the exploration of timing and movement via digital vector graphics, digital ink and paint software and digital editing software to complete an animated sequence. Digital Camera, Large Flash Drive, Access to Computer, Assorted Materials. Various Drawing media and Surfaces.